WOLF’S HEAD DOT 3 Brake Fluid performs a variety of very important functions in the braking system. They transmit the required power, minimize corrosion, lubricate, control proper seal swelling, and operate over a wide temperature range. 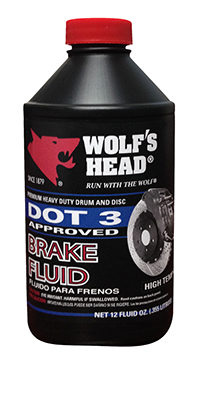 WOLF’S HEAD DOT 3 Brake Fluid meets or exceeds the requirements of Federal Motor Vehicle Safety Standard (FMVSS) 116 DOT 3, SAE J1703 and ISO 4925. DOT 3 Brake Fluid features a minimum boiling point (ERBP) of 450 F, and helps prevent corrosion, improve seal life and properties, and controls viscosity over a wide temperature range.